This film based on the true post-Watergate interview was nominated for 5 Oscars (albeit not winning one). This has always been one of my favourite serious dramas, vividly bringing a historic moment in American history to life. Based on the true-story, the film follows President Nixon’s (Langella) resignation from the White House following the Watergate scandal. President Nixon’s resignation speech was watched by millions worldwide, including British TV chat-show host David Frost (Sheen). 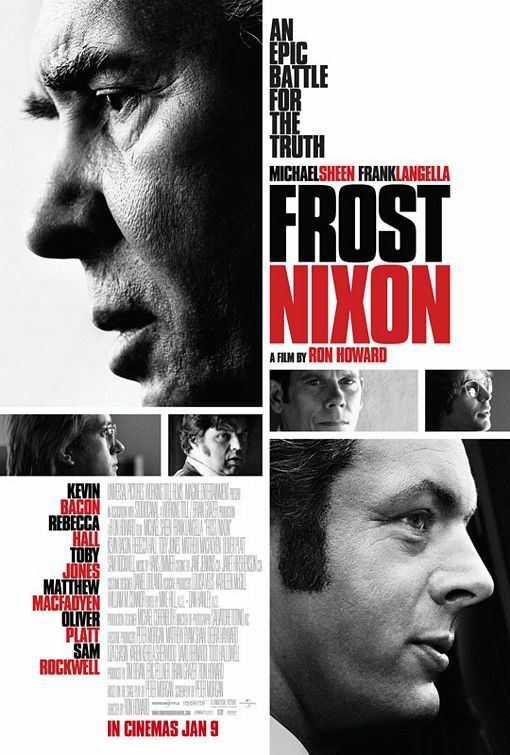 Frost, seeing the attention around Nixon as a way to make it in America, tries to arrange a series of interviews with the former President of the United States. Nixon, disgraced by Watergate and looking for forgiveness from the American people who ousted him, sees the interviews with the British entertainer as an easy way of clearing his name with the people. As Frost gets to America he realises the magnitude of what he is about to do – nobody could talk to Nixon for three years, and now Frost, a British entertainer whose New York chat-show was cancelled, has the only opportunity to get the apology out of Nixon that nobody ever could. What this film does brilliantly is it puts you right in the thick of it. Even if you have no interest in the story, or politics or the scandal itself, Frost/Nixon does a brilliant job of setting the scene and getting you as the viewer informed and involved in what’s happening. I am aware of the Watergate scandal, but have no knowledge of Nixon the man, Frost the presenter or what happened, but after watching the film even I felt like an expert on the subject! This is an informative film, but it doesn’t at any point get dull or boring, which is quite a feat. A lot of the film is shot in an interview style, where the characters are reflecting back on the events of the film, an idea which you would assume came from Peter Morgan, who actually wrote this as an actual play before he turned it to a screenplay. That’s such a clever idea by Morgan as it heightens the importance of what’s going on, giving the piece a more historic and momentous feel. A really clever idea which not many would have though to do, so kudos to Mr Morgan! Michael Sheen is one of my favourite British actors of his generation, and delivers a very dramatic performance in this film. Now, I can’t really say if it was an accurate performance because, like I said, I don’t know David Frost, but what I can say is that Sheen delivered a well-timed, clever performance that shows the experience he has as an actor. Opposite Sheen, Frank Langella delivers what is clearly the defining performance of his career, bringing President Nixon to life. Everything about him seemed on point and even though I don’t know Richard Nixon I believed everything I was seeing, quickly forgetting about the actor and focusing on the person he was portraying. All of the supporting actors follow in a similar vein, with solid performances across the board in Frost/Nixon. The very experienced Ron Howard does a very good job of putting us into the action here with his direction. The way the interviews are shot is the making or breaking of this film, and Howard did an exceptional job creating drama with his shots. I would like to say something about the 70’s feel of the film, but it never really felt that important to me watching it. I think back to American Hustle, a film which went all out to create that old style and ram it in your face. That’s not what this was, and while it may have been a 70’s style film (I honestly don’t know), this film didn’t really shout about it, letting the actual story do the talking. Overall, this is an incredible portrayal of what is a huge moment in the history of America. Now, you may know by the type of film that is usually reviewed here, that I’m not the biggest fan of films that take themselves too seriously. Also, I have a really short attention span and rarely watch films over two hours. However, this film is dramatic, knowledgeable, gripping enough that the time just flies by, and led by two fantastic acting performances pitted against one another. If you’re interested, here’s the real moment when David Frost extracted the apology from Richard Nixon.